You are here: Home / News / So Called Black ‘Leaders’ Are Not Held Accountable For Their Actions, Wonder Why? So Called Black ‘Leaders’ Are Not Held Accountable For Their Actions, Wonder Why? (ThyBlackMan.com) A Fox News headline read: “Black leaders express ‘profound indignation’ over Dem leaders’ failure to ‘protect’ Maxine Waters.” I submit that using “leader” to describe these people is a perverse form of oxymoron. Leaders wouldn’t support nor sit stoically silent, while the progressive’s black-baby-killing industry is responsible for the murder of over 17.3 million black children. Put another way, so-called “crayon-color” leaders don’t sit silent while black mothers at the behest and monetary enrichment of Planned Parenthood have murdered 45 percent of the entire black demographic. Maxine Waters is not only a disgrace to the position she holds, she is a disgrace to bipedal life forms that walk without knuckles dragging on the ground. Waters has been relentless in her calls that the staff and supporters of President Trump be bullied, threatened and attacked in whatever public venue they are observed. We can but imagine the hell that would result if a white Republican congressperson were to call for the same treatment against Obama and his supporters. Remember the destruction by blacks in the L.A. Watts riots, the destruction by blacks in St. Louis in the aftermath of Michael Brown, and images of blacks burning and looting entire neighborhoods in Baltimore in the aftermath of judicial outcomes they disagreed with? The fact that these so-called “black leaders” are not condemned in the harshest possible terms is an unsettling conundrum that proves blacks are not held accountable for their actions, unless they offend or violate the protected species of white persons. Sharpton and Brazile feign outrage at the Democrat leadership of House Minority Leader Nancy Pelosi and Senate Minority Leader Chuck Schumer for failing to defend the crazed behavior of Waters. However I believe it’s prudent to ask if Sharpton and Brazile are being perniciously disingenuous. I submit their complaint of Waters not being protected is a red herring. What should Waters be protected from? Should Waters be protected from prosecution if a family who supports President Trump are attacked and savagely beaten by black hoodlums who reveal they were following the admonitions of Waters? I argue that Sharpton and Brazile signing a letter of outrage, claiming Waters isn’t indemnified from prosecution for the incitement of public mayhem and injury, centers upon their fear that if Waters is sanctioned and held accountable for her calls of violence and intimidation against President Trump supporters and staff, they too may be held accountable for their inciting violence. Especially Al Sharpton. December 8, 1995, Sharpton incited the violent firebombing of Freddy’s Fashion Mart in Harlem, which resulted in “the deaths of Angelina Marrero, Cynthia Martinez, Luz Ramos, Mayra Rentas, Olga Garcia, Garnette Ramautar, Kareem Brunner, names forever linked together as the seven victims of the Sharpton-caused massacre at Freddy’s Fashion Mart.” (See: “Nineteen Years Ago, Al Sharpton Incited the Massacre at Freddy’s Fashion Mart“) Sharpton walked away free from responsibility. 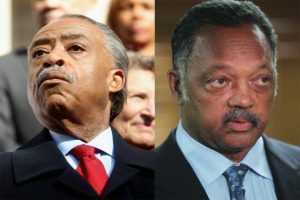 Sharpton did not come close to receiving punishment for the aforementioned, just as he has been allowed to incite violence and destructive protests his entire life. Brazile, albeit marginally less flamboyant in her numerous acts of unethical behaviors, including lying about her involvement in election skullduggery, is nonetheless as corrupt as Sharpton. It’s my firm belief that a first-year law student could build a strong legal case against Sharpton and Brazile for the near-immeasurable economic damage they’ve instigated in neighborhoods across the nation. And while Brazile is more serpentine in her inciting of same, she is no less an elapidae. I conclude Sharpton and Brazile fear that if Waters were held accountable for inciting violence, riots and mayhem against innocent citizens – it could signal the beginning of holding them accountable for violent destruction, death, and mayhem they incite in urban neighborhoods. Non Sequitur ! Non Sequitur ! There are non more despicable than the man we now call our president. His mantra ” Make America Great Again ” ( MAGA ) is the old ancient latin word for MAGICIAN. He is capable bringing true potestas magis (power of the magician) which he demonstrates daily. His charisma (Luna de persona, chiefly created by the false doctrines of white supremacy ) shall attract all who shall see in him what they want to see. Many shall see riches, others shall see fame and wealth and yet not any shall truly know the length of his “cable tow.” A magician is one who bends the minds of others to his will. Let no one doubt that he did this on election night. Mind is one’s attention, and through the spells of wealth, lasciviousness, television and music he has grabbed and holds the attention of the world. Will is Trump’s appetite which is his desire to lead America.The President Elect has millions of subjects to micro-manage. He will put his magic wand, better known as the twitter spotlight, and all other appropriate technologically advanced machinery on anyone who dares to challenge his authority. How quickly, with the stroke of a pen at the ballot box, some have brought this kind of behavior down on us all. The sanity test for American citizens will be our willingness to defend every word of our Constitution, and every decision by our Supreme Court against the idiosyncratic behaviors of our titular head and his hand-picked band of cabinet members. The old America is dead. America died when many voters snatched the formalities of law, liberty and freedom from Uncle Sam’s hand. Donald Trump, the re-coiner of all coins, the model of contemporary amoral man, is now our fearless leader.Voters made the hedonistic choice thinking that they were choosing pleasure promised over pain being suffered. Trump’s base members are out of their minds and give great cause for African American leaders to defend against their destruction at the hands of the deceived.